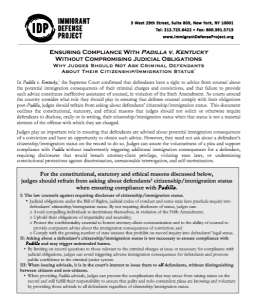 In Padilla v. Kentucky, the Supreme Court confirmed that criminal defendants have a right to advice from counsel about the potential immigration consequences of their convictions, and that failure to provide such advice may constitute ineffective assistance of counsel, in violation of the Sixth Amendment. As courts around the country consider what role they should play in ensuring that defense counsel comply with their obligations post-Padilla, judges should refrain from asking about defendants’ citizenship/immigration status. This document outlines the constitutional, statutory, and ethical reasons that judges should not solicit or otherwise require defendants to disclose, orally or in writing, their citizenship/immigration status when that status is not a material element of the offense with which they are charged. This advisory was prepared by the NYU Immigrant Rights Clinic in collaboration with IDP.